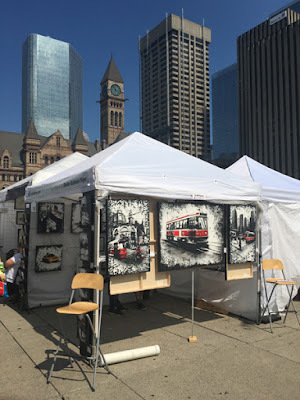 The Toronto Outdoor Art Exhibition was absolutely amazing! The Toronto public is always so generous, knowledgeable and kind, it was a joy to welcome each and every one of you in my booth on Nathan Phillips Square last weekend. Thank you to all of you who braved the extreme heat and the occasional downpour! And of course a Big, Big Thank You to the amazing organizers and volunteers who worked their bums off to make this another amazingly successful show! Everything was a bit damp when we started our set-up on Friday morning but the rain was intermitted and eventually just gave up entirely, making way for some beautiful blue skies and scorching heat. The location of my booth was absolutely amazing! I was right in from of the beer garden and because I was on a corner I was able to open up one of the sides and have this whole extra wall, doesn't it look amazing?! Quite a few of my pieces found happy new homes over the weekend! It's always a little sad to say goodbye to one of my babies, but knowing that they are off to a good home where they will become part of an amazing art collection does make me very, very happy. I'm back in Montreal now and, although many of my pieces found new homes over the weekend, I still have plenty of amazing pieces available. So if there was anything the caught your eye in booth 158 last weekend just shoot me an email! I'm happy to be back in the studio as well. I have a few things coming up later in the year but for now I can finally start working on those 2 48"x60" pieces that were waiting for me, one is going to depict Los Angeles and the other one will be an amazing scene from San Diego! 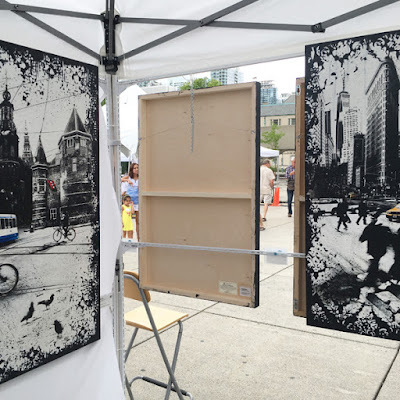 I'm also working on two lovely commission pieces for one of my amazing Toronto collectors, she fell in love with this one piece in my booth but it was simply too large for her space. So we talked about how we could create something similar that would be a perfect fit and we came up with these two pieces that I'm really excited about! I love working with my collectors to give them the perfect piece for their collection! So plenty of stuff to keep me busy these upcoming weeks! I'll keep you posted! 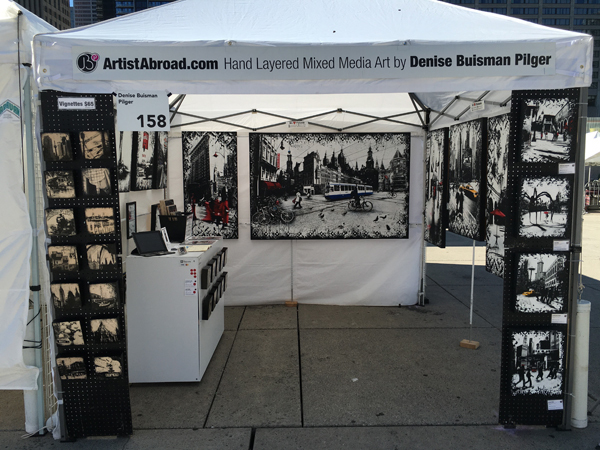 Booth 158 at the Toronto Outdoor Art Exhibition this weekend! I'm so excited! 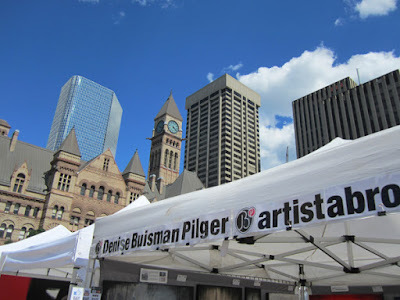 It's almost time for the Toronto Outdoor Art Exhibition and I have so many new things to show you! I've spent these past few weeks working like a crazy woman to finish 7 brand new pieces. Below you will get a little sneak peek but if you're in the neighbourhood I'd love to show them to you in real life. 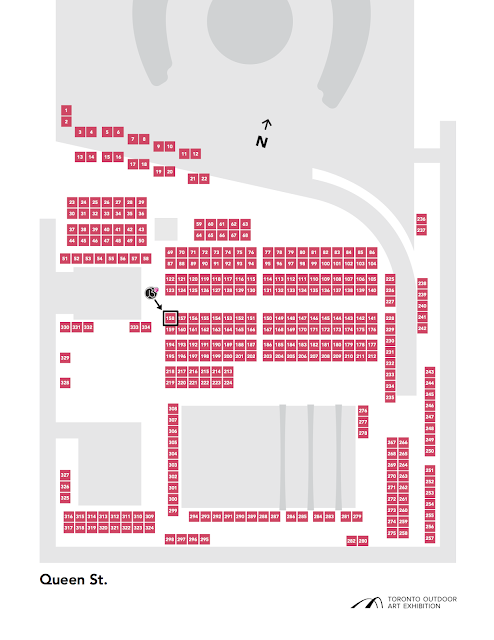 You will be able to find me in booth 158 (see map below). 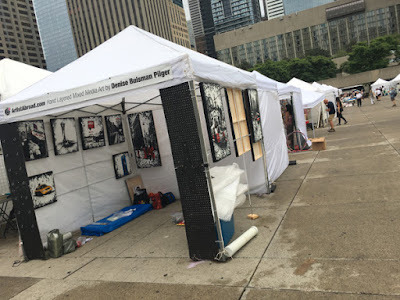 I will be there on Friday July 8 and Saturday July 9th from 10am-8pm and on Sunday July 10th from 10am-6pm so plenty of time to come by and say hi! 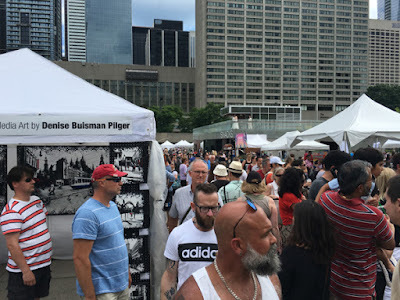 This is the 55th year that the Toronto Outdoor Art Exhibition is taking place, it is Toronto’s first, largest, and longest running outdoor art fair. More then 100,000 come visit us over the weekend and I hope you will be one of them! With over 350 artists exhibiting and some awesome art events like pop-up art talks, awesome art installations and an actual beer garden, Nathan Phillips Square is definitely the place to be this weekend! If you make it to the square please come say hi in booth 158, looking forward to seeing you!